In 2004, Achieve, a nonprofit education reform organization, published a research report titled "Ready or Not: Creating a High School Diploma That Counts" that pointed to the fact that in the U.S., high school standards were not meeting the expectations of employers and colleges. This led to the development of a Common Core State Standards initiative in 2009 to improve the standards of high school education. With 46 of 50 states adopting the common core, there has been a paradigm shift from rote-based learning of yore to interaction-, collaboration- and communication-based learning. Such a shift has necessitated the insurgence of technology into the classroom which was, prior to the initiative, an optional addendum. Consequently, the concept of "blended learning", which was introduced as early as 2000, has assumed more importance than ever before and has transformed from a theoretical concept with rudimentary applications to an essential part of mainstream education, encompassing a wide array of technological tools, gadgets and concepts. Blended learning, which once referred to use of computer and web-based training in class, has now evolved into a mammoth education program that merges traditional classroom-based instruction with technology enhancements such as electronic whiteboards, Internet devices, multimedia assistance, digital textbooks and online lesson plans. Blended learning, in its current avatar, is a complicated endeavor that requires meticulous planning before and during implementation. It goes beyond just providing schools and students with computers, and entails creation of personalized learning models that match the student, school and societal needs and competencies. Blended learning models largely fall into one of two categories -- rotation model and flex. In rotation models, the student alternates between face-to-face conventional classroom learning and guided computer learning. This is usually practiced at the primary school level. The flex model is preferred in high schools where a digital curriculum comprising projects and online tutoring allows students to work independently and at their own space and pace. A third model called "self-blend" model is described by Innosight Institute, where the student chooses additional online courses to supplement her school curriculum in order to gain credit or recover a missed credit. Innosight Institute also proposes a fourth model, the Enriched Virtual Model, where an entire course or class is taken online with occasional face-to-face meetings with the teacher or convenor. 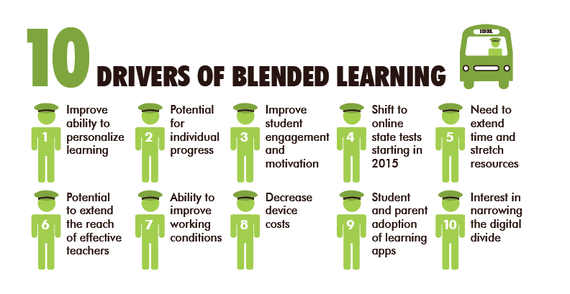 Why would a school want to engage in blended learning? Will it meet the goals and objectives of the school vis-a-vis societal expectations? What student benefits are sought? Academic success in terms of grades? Time savings? Preparing the student for college? Which model will suit the school, its students and the community and why? What is the support (monetary, technical) available? How much of community engagement will it entail? 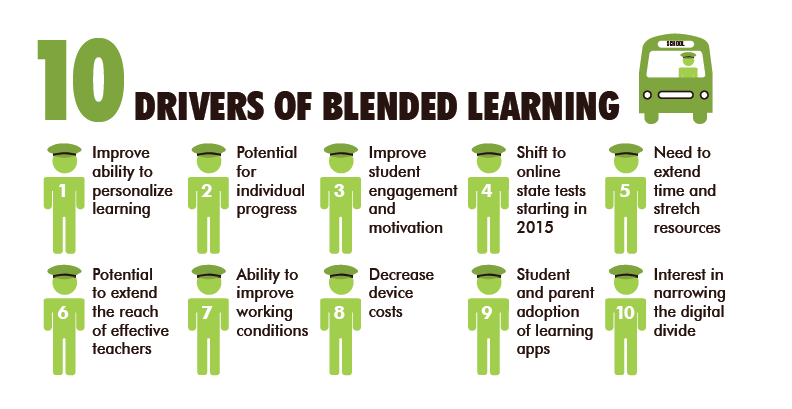 Blended learning has been gaining acceptance in the high school level throughout America. What started off as 45,000 K12 students taking online courses in 2000 has grown to over 4 million students participating in some kind of formal online-learning program by 2011. Two factors, beyond the need to comply with common core standards, drive the adoption of blended learning by schools -- the growing shortage of teachers combined with cost and time savings possible with replacing some of the human resources with digital media, and the No Child Left Behind Act that has elicited competitiveness among schools and students in statewide summative assessments. Another subtle, but important influence is the morphing of many technology companies into providers of learning management systems, online assessments, digital gradebooks, and education data systems, who have, by their aggressive marketing strategies, increased public awareness of alternatives to traditional learning methods. Being a nascent field, there are naturally many technical, organizational and design challenges to blended learning that include the need for teachers and schools to adopt a different approach to teaching, complexities in managing the dual learning environment and the importance of preparing the setting. But these can be surmounted by methodical, diligent and consistent effort. What can be more difficult to surmount are attitudinal blocks, in that blended learning challenges the status quo and can be perceived as collapsing the integrity of the traditional academy. Attitudes not only hinder (or advance) the technical, organizational and design activities, but can also significantly influence policy planning decisions. Blended learning is an evolving, dynamic organism that cannot be forced into a custom template. For example, is there a golden ratio to face-to-face and online learning activities? There obviously cannot be, given that there are unlimited possible combinations, all perfectly valid or invalid given the learning, social and cognitive needs of a community. While this fuzziness can complicate policy planning, the very same flexibility enables tailorability to maximize potential. Good blending comes from establishing equilibrium between the learner and the learning objective. Whether blending is a simple process of combining two learning methods (face-to-face and virtual) in judicious proportions, or as complex as completing an entire education program, the "classroom of the future" has undoubtedly evolved from being a disjoint adjunct it was a decade ago, to mainstream education.